This book has a ton of information on the daylight defense of German skies during World War II. The authors toiled ten years to bring this excellent history to us. It is filled with facts and figures, but also has 160 photos and numerous maps and diagrams. One of the main points, if not the most, that the authors show us is that before the start of the war Germany gave no thought to defense against bombers. The high command seemed to believe in all of the writing between the two wars that said that "the bomber would always get through". Germany's strategy was to hit first and hardest and let defense be damned. Unfortunately for them, the small pin prick daylight raids up until the beginning of 1942 were dealt with easily by the small slapped together air defense that they had at the time. This led the high command to believe that they did not have much to worry about as far as daylight bombing. The appearance of the U.S. Eighth Air Force would prove them wrong. The book continues to show how the off the cuff arrangements for daylight air defense were progressively upped until most German fighters were brought back to Germany to help defend their nation. The various personalities and their successes and failures are shown us, such as Goering, Galland, and Milch etc. 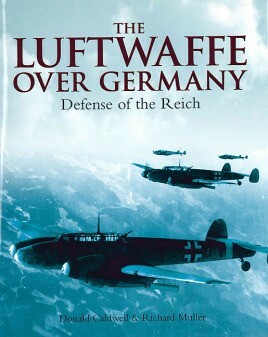 The authors have also used many first person accounts to show how the air war over Germany was experienced by the Luftwaffe. The book is filled with many tidbits; one explains that the B-24 bombers had to fly in formation a few thousand feet lower than the B-17 bombers. I had always wondered why the B-24 with its larger payload was not more extensively used in Europe. All of the different steps in the technology war over the skies of Europe including radar and planes are shown by the authors. The gradual loss of the air war by Germany is described, and the desperate measures the Luftwaffe was forced to use. Ramming and the near suicidal use of the Me-163 are gone into. Looking for a better book on the German air defense of the Third Reich in daylight during the war would probably be a useless endeavor. The authors have shown that it was a much closer battle than is usually shown to us. The personal accounts show exactly how much the German fighter pilots were wary of taking on American bomber streams, and for good reason. This book belongs on the shelf of anyone who has an interest in the air war over Germany from 1939-1945.